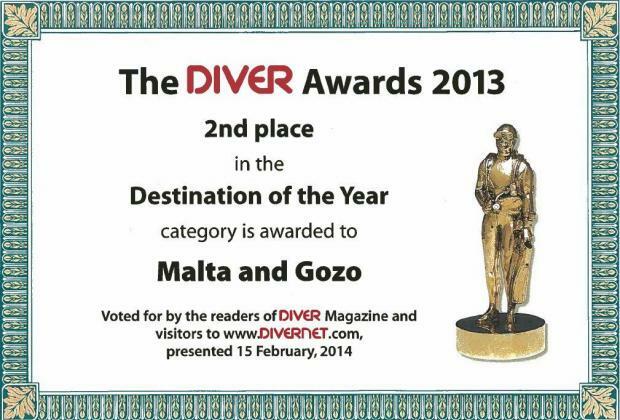 The Maltese Islands have been voted as the 2nd ‘Best Diving Destination’ at two award ceremonies in London, namely the Diver and Sport Diver Awards. The awards confirm the Maltese archipelago as the top diving location in the Mediterranean. Winners and nominees were voted by readers of Diver Magazine, Sport Diver Magazine and visitors to their respective websites. The Diver Awards ceremony took place at the main LIDS hall at Excel London during the International Dive Show, presented by diving explorer and celebrity, Monty Halls. This year, Malta and Gozo managed to surpass the Maldives and were awarded 2nd place due to their range of exciting wrecks, variety of marine life, topography and shore-diving. The ‘Best Diving Destination Of The Year’ awards saw a strong category of diving spots across the globe with Egypt taking first place and the Maldives in third place. Presented by editor-in-chief Mark Evans and diving explorer Monty Halls, the Sport Diver Awards took place at Aston’s Champagne and Wine Bar, London. The Maltese Islands received the runner up place in the category for ‘Best Destination’ fighting off competition from the Maldives, Indonesia and Thailand. Egypt was awarded 1st place in the category. The awards for ‘Best Customer Service’ and runner up for ‘Best Overseas PADI Dive Centre’ were received by Divewise, one of Malta’s leading Dive centres. Commenting on these awards, Mr Josef Formosa Gauci, the CEO of the Malta Tourism Authority said: “We are truly honoured to accept these distinguished awards and the recognition they bring with it. We are continuously striving to enhance our diving product to provide visitors with an unforgettable diving experience. "Malta and Gozo are a unique diving destination with clear blue waters, a wealth of wrecks and an exquisite range of marine life. Receiving these prestigious awards will make us work even harder to maintain and improve on these positions next year”.